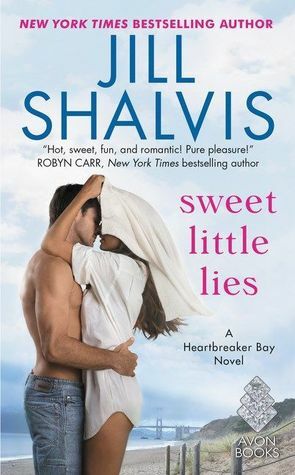 Sweet Little Lies is book one of the Heartbreaker Bay series. I'm thinking this is my first Jill Shalvis book ever, so I was glad to get to try one of her books out finally! I've seen so many of yall love her work before and have to agree her stuff is was quite good. We start off meeting Pru, she's the captain of a tour boat and stays quite busy. She's recently moved into a new apartment and found an Irish pub close by that makes delicious food. It doesn't hurt that there's a hottie (Finn O'Riley) that runs the place with his younger brother. There's an instant attraction between them and though Finn is all work and no play, he starts changing his ways for Pru little by little. I enjoyed their relationship as well as their friends that make appearances. It felt like a real life situation with the exception of the looming secret that Pru has that could potentially crush anything between them. She's too afraid to tell him, and you just know it will blow up in epic proportions when it's revealed. As I said, this is my first Jill Shalvis novel and surely won't be my last. I really loved how she created characters that were down to earth and you could easily connect with them. The funny bits were amusing and the relationship aspects were steamy and enjoyable. All in all, I'd say give this book a shot if you like Contemporary Romances where the lead character has a secret and it could ruin everything. I can't be the only one that loves those types of tropes. I need to go back and read this one...I started the series out of order! I really like Shalvis. They may not all be favorites but she is always solid. lol this one was an interesting one. Oh, the secret that makes everything go boom. The secret that is destined to be revealed at the Worst Possible Time. I'll have to put those on my TBR then, thank you!! You know, I've yet to read a single Jill Shalvis book. I even own one on audio with a narrator I love (Animal Magnetism). Glad you enjoyed this one.